The Vermicomposting Bin is constructed from 50% recycled HDPE (High Density Polyethylene) and is available in green. The bin comes with four legs that are bolted on the bin with nylon bolts and nuts. Legs are 1.25" tall which gives you ample space between the tray and the bin for air flow. The lid comes with four air vents. This bin was designed primarily for the school kids so they could teach mom and dad about Vermicomposting. Other uses have been for growing live foods as advocated by the late Dr. Anne Wigmore for apartment dwellers and cold weather areas. 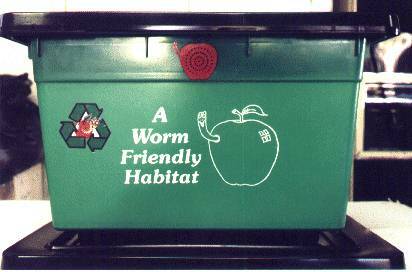 This worm bin needs a minimum of 1 pound of redworms to start up. Bin comes with bedding and manual for set up and maintaining a healthy bin. Manual also contains information for automatic separation of all the worms from the castings. No more dumping and hand sorting. When multiple bins are needed, these vermicomposting bins may be stacked on top of each other. The larger bins become too heavy and unmanageable when filled with worms, their castings, and food.